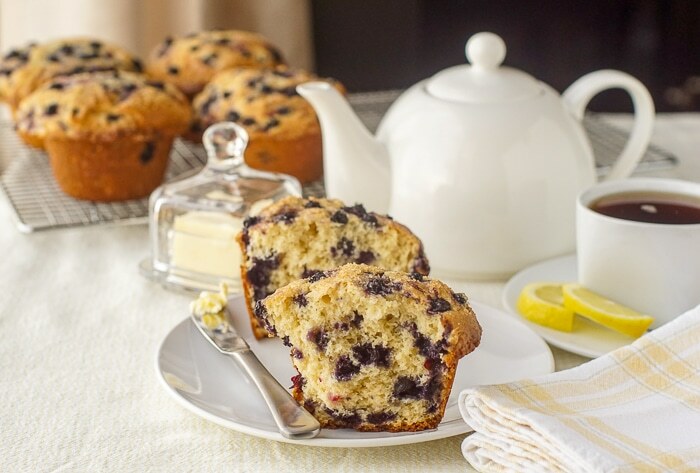 Bakery Style Blueberry Muffins. Just like your favourite bakery makes! 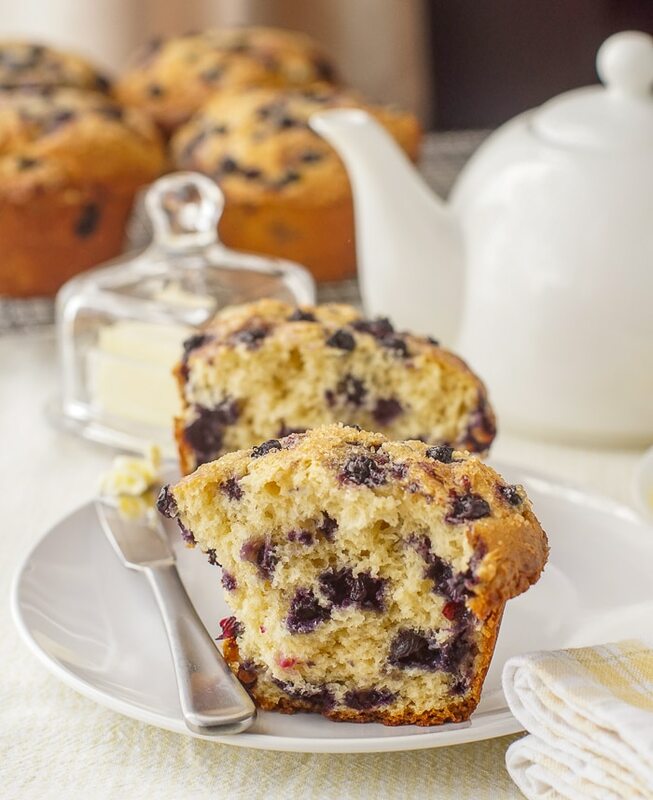 Bakery Style Blueberry Muffins. 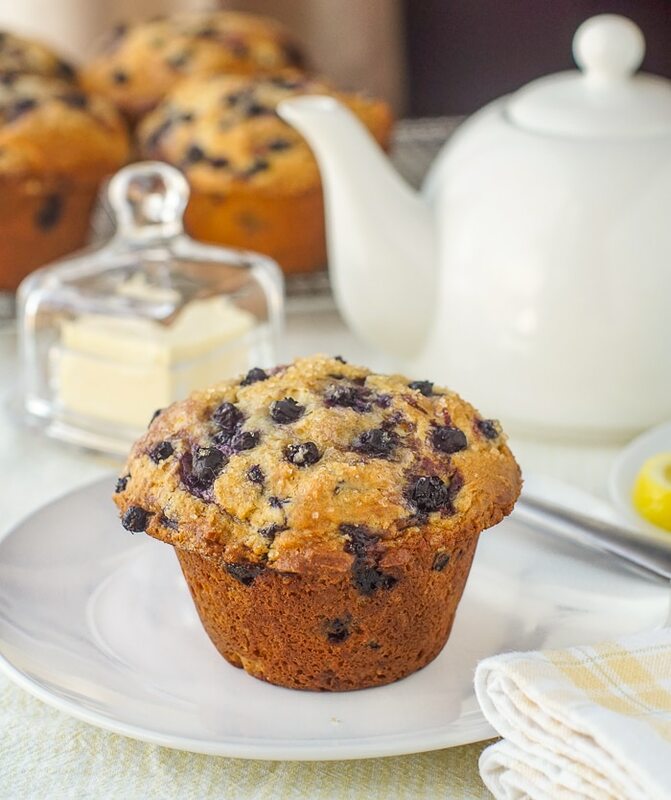 Big, moist, perfectly baked blueberry muffins with a distinct crispy edged muffin top. Just like your favourite bakery muffins! Is bigger always better? When it comes to muffins, I definitely think it is. I had a conversation about muffins a little while back with a friend who loved a good morning muffin. He said muffins he made at home just weren’t the same. First of all, although, yes, I do use them for convenience and time sometimes, I really do not like using cupcake liners for muffins. They interfere with the natural development of browning on the bottom of the muffin and more importantly the development of a good muffin top. Bakery Style Blueberry Muffins ready for the oven. A good muffin top breaks free of the limitations of the height of the pan. Where the muffin batter meets the top of the pan, a crispy ring forms, adding texture and flavour. You should be able to pop the muffin top off and eat it first, or save the best for last and eat the bottom first! For me, that all adds to the enjoyment of the muffin. 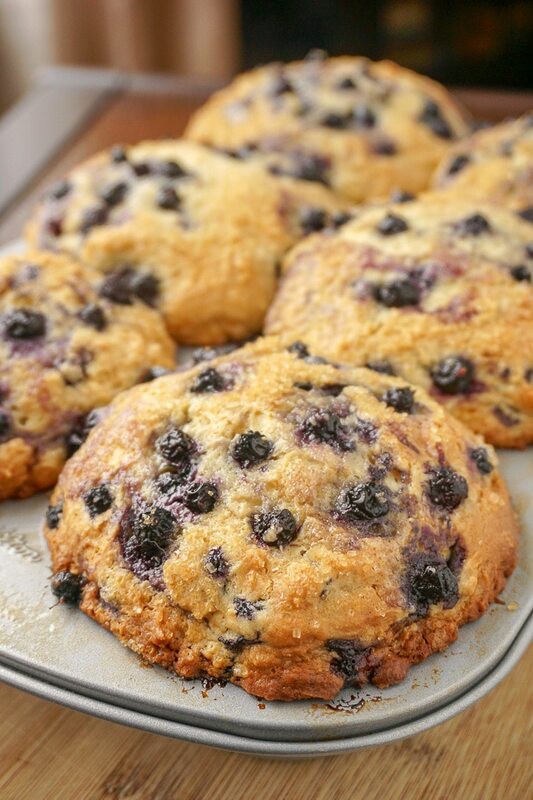 Bakery Style Blueberry Muffins, larger pans make it easier. The simple truth is that this is much easier to accomplish in a large muffin pans than in smaller ones. This past week, I ordered a set of jumbo muffin pans from Amazon and set out to tweak my recipe in search of perfection. The real challenge in getting the recipe right was the thickness of the batter. 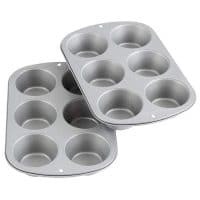 Too heavy and the muffins would be stodgy, too loose a batter and it will spill out over the pans and burn. Yes, I admit, I did smoke out the kitchen with my first batch and set off the smoke detector! I’m not above a baking mistake or two myself from time to time. This time it was in the aim of experimentation to get the batter right. In the end it was worth it. 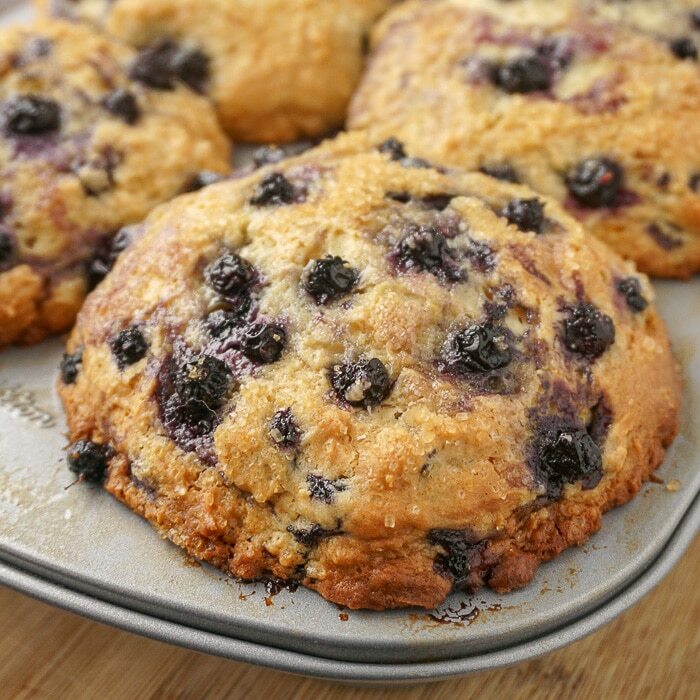 Using smaller pans for Bakery Style Blueberry Muffins. Don’t be dismayed if you don’t have a set of jumbo muffin pans. This recipe is also good for a batch of 12 standard sized muffins. If using those pans I would up the temperature to 375 degrees F or even 400 as in my standard Chocolate Chip Muffins recipe. 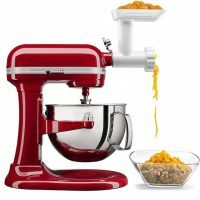 This will help a lot toward achieving those muffin characteristics that are so desired. A couple of finishing touches really add to the appearance and flavour of this recipe. I add a tsp of berries to the top of each muffin and then a liberal dusting of turbinado sugar. These touches makes them look absolutely perfect. The turbinado sugar (raw sugar) on top, although optional, can add more crunch to the muffin top. I’d say it’s well worth the small investment to get a set of larger muffin pans for recipes like these. Next stop for me will be big, perfect bran muffins! 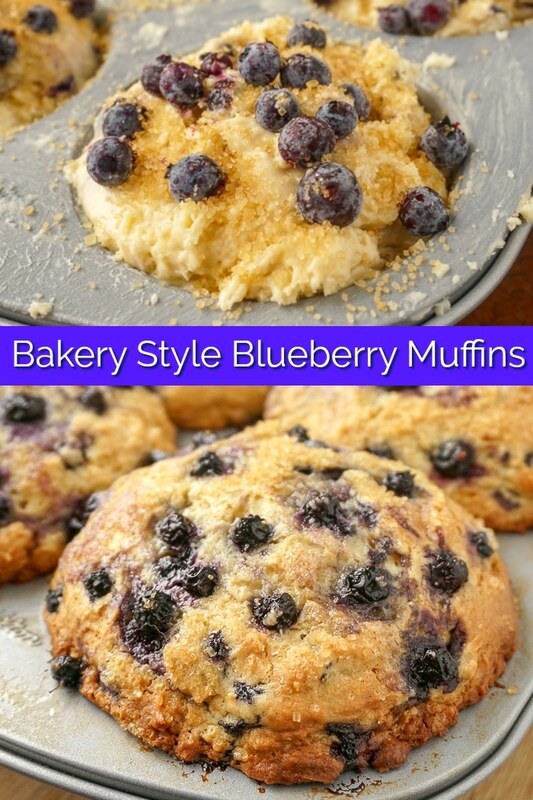 Like this Bakery Style Blueberry Muffins recipe? You’ll find many more great recipe like this one in our Muffins & Scones Category and in our Brunch Category. For even more delicious ideas for brunch, we have put them together into one amazing collection of our 25 Best Scone Recipes. 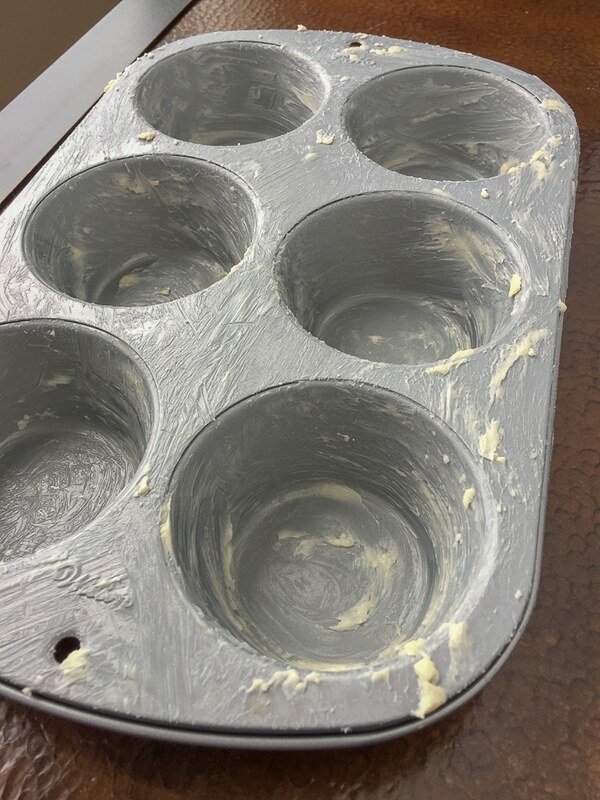 Preheat oven to 350 degrees F. Grease a jumbo muffin pan (6) with butter, this includes the top of the pan. 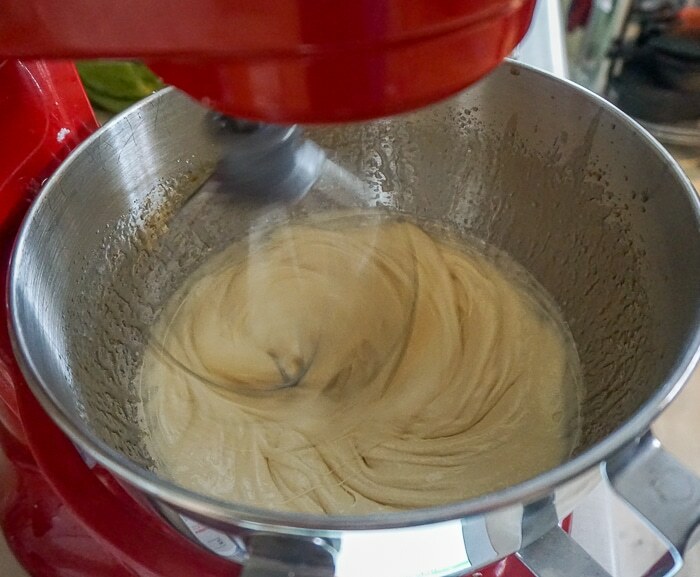 In the bowl of a stand mixer with the whisk attachment in place, whisk together the eggs, sugar, and vanilla extract on high speed until foamy and slightly stiffened. Mix together the melted butter and vegetable oil in a measuring cup with a spout. Add the 2 tbsp of apple cider vinegar to a measuring cup and fill to the one cup mark with the evaporated milk. Add this soured milk slowly to the mixing bowl continuing to mix but at a reduced speed. Fold in the dry ingredients by hand with a rubber spatula being careful not to over mix. Don't worry about lumps in the batter, they are fine. When the dry ingredients are almost incorporated, gently fold in the blueberries. 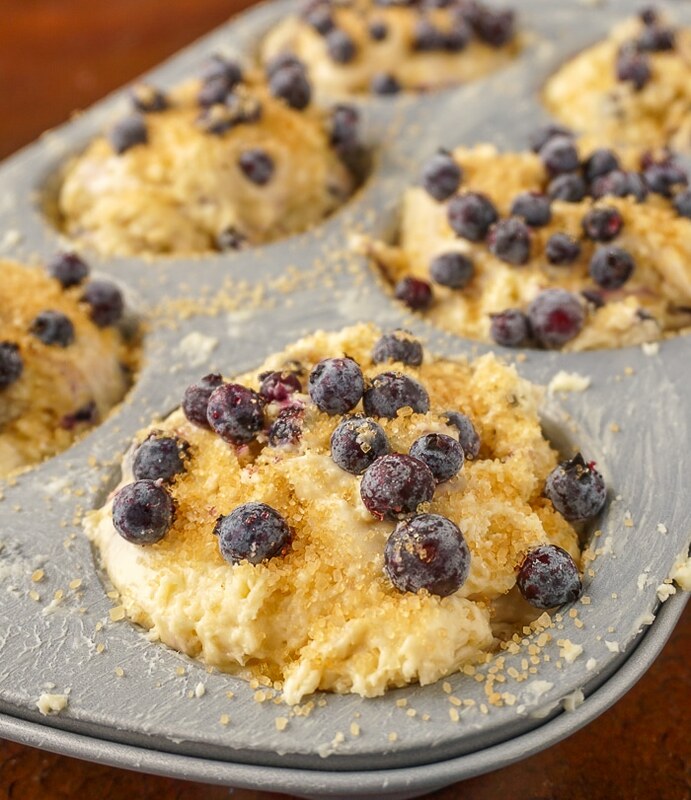 Spoon batter into well greased jumbo muffin tins, filling them to the top. If you like you can sprinkle about a teaspoon each of blueberries and turbinado sugar over the top of each muffin before baking. Bake in a preheated 350 degree F oven for about 35 - 40 minutes or until a wooden toothpick inserted into the centre of a muffin comes out clean. You can bake these in standard muffin pans. Just increase the heat to 375 or 400 F and bake for about 20 minutes or until a toothpick inserted into the centre comes out clean. UPDATE: I have had a couple of questions on using frozen blueberries. Yes they are fine to use but you may find the baking time to me a bit longer. Watch them carefully and trust the toothpick test to know when they are perfectly baked. Cookie/ Ice cream scoop set. 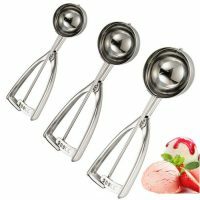 I keep my frozen berries in the freezer until the last possible second, fold them in as quickly as possible and use an ice cream scoop to fill the pans. Keeping ingredients like the milk as cold as possible is also a good idea. I’ll update the notes for this recipe. Seems like lots of folks need some advice on this. Do you have to bake them longer if using frozen berries? Recipe is updated. Please see notes. 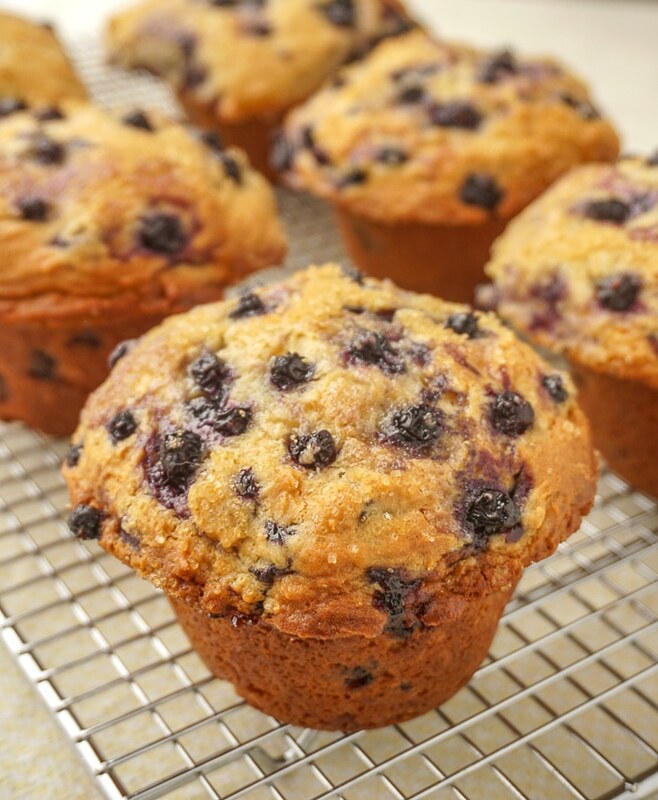 This is THE BEST blueberry muffin recipe I’ve ever made and the folks Ii shared them with thought the same. Can you use buttermilk instead of evaporated with vinegar? It should be as thick as shown in the photo in the pan. Frozen berries will make it even stiffer. You may need a higher heat in your oven.